The hearty laugh of Tsuruya-senpai... is not her most well-known trait. Due to saying "Nyoro~n" just once, an internet meme was born of an alternate chibi version of her. Repeat: Churuya is very different to Tsuruya-san. Tsuruya-san is in the same year as Mikuru and is her close friend. She has a wealthy background but she isn't haughty over it; you wouldn't realise it from just meeting her in the classroom. 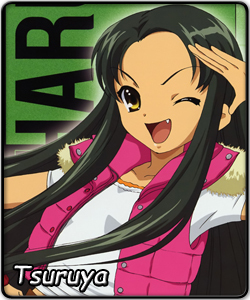 In fact, it's not an exaggeration to say that she's at Haruhi-level overall competence both in intelligence and in sports sense. This is harder to discern from just season one; the fact she can even hit a near-professional level baseball pitcher's ball is a good hint though. With the resources and connections that Tsuruya-san has, Haruhi labels her an honourary member to the SOS-dan. Unlike Haruhi, she's not interested in avoiding the mundane at all costs. Thus she doesn't run around creating havoc for everyone else. Then again, the heir to a powerful family means she's not a commoner in the first place, so perhaps she doesn't have as much issue with enjoying ordinary things as Haruhi. A cheerful, friendly and energetic lady; whose long fits of intense laughter are easily triggered.